Synthetic peptide: GKNAHGWQEDKL, corresponding to C terminal amino acids 244-255 of Human ELF5. Our Abpromise guarantee covers the use of ab13581 in the following tested applications. Transcriptionally activator that may play a role in regulating the later stages of keratinocytes terminal differentiation. Isoform 2 binds to DNA sequences containing the consensus nucleotide core sequence GGA[AT]. Transcriptionally activates SPRR2A and the parotid gland-specific PSP promoters. Expressed exclusively in tissues with a high content of epithelial cells. Highly expressed in salivary gland, mammary gland, kidney and prostate. Weakly expressed in placenta and lung. Isoform 1 and isoform 2 are differentially expressed in different tissues. In the kidney, only isoform 1 was expressed, while prostate expressed both isoforms, with levels of isoform 2 being higher. Expression is up-regulated during keratinocyte differentiation. Several epithelial carcinoma cell lines showed lack of expression. The PNT domain acts as a transcriptional activator. 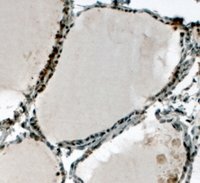 ab13581 at 4 µg/ml staining ELF5 in Human thyroid gland tissue by Immunohistochemistry (Formalin/PFA-fixed paraffin-embedded sections). Steamed antigen retrieval with citrate buffer pH 6, HRP-staining. Publishing research using ab13581? Please let us know so that we can cite the reference in this datasheet. There are currently no Customer reviews or Questions for ab13581.